The Lesson of the Shamrocks continues for me. Awhile back, I blogged about these precious plants that my grandmother had given to me years ago. To make a long story short, I thought they had died, and was so very thankful to realize that they hadn’t died. When they emerged from the soil, they were healthier, fuller, and more beautiful than ever. Well, that was then. A few weeks ago, we had a new saga with the Shamrocks. The story included a 14 year old boy with a dog on a leash. They were on the deck and the boy (who will remain nameless to protect the not so innocent) gets distracted and wants to go inside, attaches leash to table with pot of shamrocks on it. Dog tries to run to follow boy inside, and moves the table quickly which results in the ceramic pot of shamrocks flying through the air only to land with a loud crash on the cement deck. 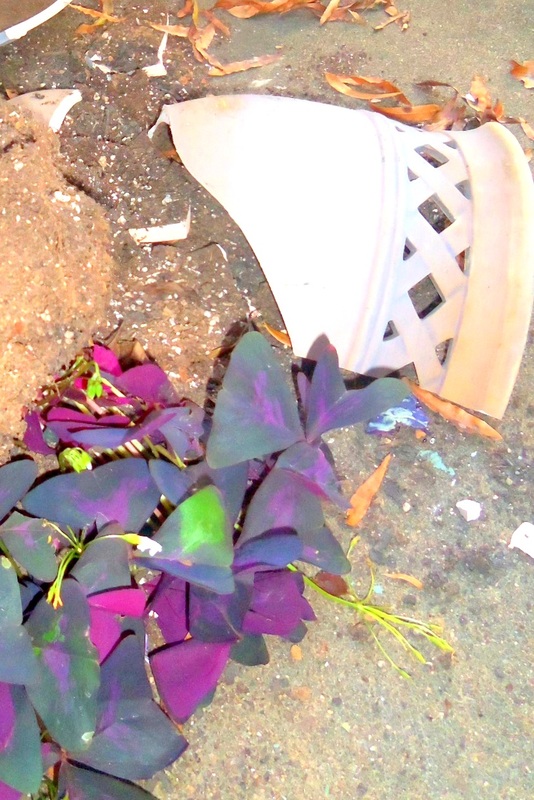 Voila, soil and shamrocks spilled out in a mix of broken pottery and bulbs. The mom (me) comes out and sees the whole deal and recognizes the fact that often 14 year old boys do not totally engage the brain and gives him grace and a free pass on this one. But the shamrocks are all over the place. And even though it’s just a plant, it again brings up the sense of nostalgia and loss for the grandmother who had given me these shamrocks so many years ago. I don’t cry over spilled milk or dropped pots. I’ve so learned by experience that gets you nowhere. So,I gathered up the bulbs, and proceeded to plant them in not one, but three pots. Now, only a few short weeks later, the bulbs are quickly blooming and filling the pots, and I’ll have more shamrocks to share, and more to enjoy. The pots that were mostly dirt with scattered shamrocks are now filling in with beautiful blooms of deep purple. Instead of being cramped into one pot, the beauty is being multiplied. So here’s the thing. I was so enjoying the fullness of those shamrocks that they probably would’ve stayed in the same pot for years unless they had been disrupted. Sometimes the very things that we see as disruptions in our lives end up being the opportunities for growth. Sometimes we miss out because we like the status quo more than the unfinished product that takes time, patience, and process to come to fruition. We’d rather have the seemingly behaved child who is momentarily pacified than go through the painstaking process of training that brings up conflict for a moment, but peace for the long haul.Or we’d rather have a diet that takes the momentary disciplines away, but breeds only short term results. I don’t like looking at a pot of straggly plants as much as I do a full pot of shamrocks. But good things take time. They just do. And often the “quick fix” is just a temporary short cut that breeds mediocre results. Sometimes the inconvenient ugliness of process leads to beauty that far exceeds the quick result. Just some more ramblings that I need to take to heart. Discipline and growth often walk hand in hand, and vision allows both to flourish. But the road to results is full of imperfect, unlocked potential that is not yet visible to the human eye. Vision that motivates and inspires is not the kind that is seen with the eyes, but felt with the heart, and formed in the crucible of will, determination and patience. It’s the kind of vision that God must have with us. I’m so thankful He is willing to take time with this “unfinished, at times broken product”, and patiently draw me near and grow me up as His child. He sees us where we are, but encourages, refines, sculpts, and disciplines us to move to where and who we were created to be. We may feel like a broken pot, spilled all over the ground, but God sees the potential, the beauty in the midst. It is but ours to surrender to the process…and bloom.